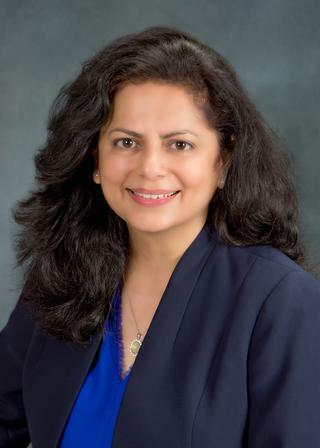 Dr. Sandhya Khurana is an adult pulmonary and critical care physician with a specialized focus in management of severe 'difficult to treat' asthma. She completed her training in Pulmonary and Critical Care Medicine at Thomas Jefferson University in 2003 where her research focus was 'airway remodeling in asthma'. She joined the faculty at University of Rochester in 2008 and helped develop a multidisciplinary state-of-the-art severe asthma program. She became the Co-Director of the Mary Parkes Center for Asthma, Allergy & Pulmonary Care in 2015. Dr. Khurana's clinical and research interests include comprehensive multidisciplinary management of severe asthma. She believes in a patient-centered team-based approach to management of this complex condition. She has expertise in application of novel therapies for severe asthma including new monoclonal antibodies and Bronchial Thermoplasty (a non-pharmacologic endoscopic therapy for severe asthma). She is the site principal investigator in multicenter clinical trials evaluating new treatments in asthma. She is a co-investigator in the SOAR (Study Of Asthma in Rochester) asthma registry focused on characterization of asthma using non-invasive biomarkers. Dr. Khurana has chaired asthma-focused sessions and participated as faculty at national and international meetings. Dr. Khurana was invited to participate in the 2015 WHO strategic meeting for management of chronic respiratory diseases in Geneva, Switzerland. She is the current Chair of Airway Disorders NetWork of the American College of Chest Physicians. She also serves on the American Thoracic Society/European Respiratory Society's joint taskforce on severe asthma. Dr. Khurana also has expertise in evaluation and management of patients with lung nodules, masses and thoracic adenopathy. She is skilled at performing advanced diagnostic bronchoscopic procedures including endobronchial ultrasound and navigational bronchoscopy. She also has additional fellowship training and expertise in Sleep Medicine.